Former congresswoman Gabby Giffords's gun control group released a report on Wednesday warning of the dangers of muzzle loading rifles, a number of other firearms, and some firearms accessories and calling for new gun control measures targeting the devices. The group, which recently changed its name from Americans for Responsible Solutions to Giffords, said in a release its report was intended to identify "extremely lethal firearms and devices" that it believes skirt current firearms laws. "Giffords—the gun violence organization founded by former Congresswoman Gabrielle Giffords and her husband, combat veteran and retired NASA astronaut, Captain Mark Kelly—are calling on Congress to update federal gun laws so these accessories can’t turn a firearm into a military-style weapon," the group said in a statement. The report includes nine examples of firearms or firearms products the group feels are a danger to society. The list includes certain kinds of ammunition, trigger devices that increase the rate of fire of a semi-automatic rifle, what the group describes as "high capacity shotguns," AK and AR style pistols with stabilizing braces, and muzzleloaders. The group said the gun industry is attempting to circumvent the National Firearms Act (NFA) and other federal gun laws through the manufacture of each of the products. Muzzleloaders, the group said, are dangerous because they are specifically exempted from the NFA and it accuses the gun industry of trying to exploit that exemption. "These laws prohibit convicted felons and other dangerous people from possessing guns, require gun retailers to be licensed, and require licensed retailers to conduct background checks on purchasers," the report said. "There is one blanket exception to these laws, however: the exception for antique firearms, including muzzleloaders. The gun industry is determined to exploit this exception." 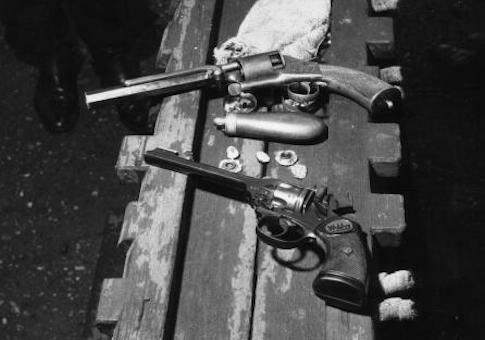 Muzzleloaders, which require gunpowder and a projectile to be manually loaded down barrel of the firearm before each shot, and other antique firearms are exempt from the NFA. The antique firearm exemption applies to "any firearm not intended or redesigned for using rim fire or conventional center fire ignition with fixed ammunition and manufactured in or before 1898 and also any firearm using fixed ammunition manufactured in or before 1898, for which ammunition is no longer manufactured in the United States and is not readily available in the ordinary channels of commercial trade," according to the Bureau of Alcohol, Tobacco, Firearms, and Explosives. The group views the centuries-old firearms technology, which was rendered obsolete shortly after the Civil War due to advancements in self-contained ammunition cartridges and semi-automatic; self-loading firearms, as dangerous because a silencer can legally be attached to it without the paperwork or tax stamp associated with other firearms silencers. "Cue the .50 caliber muzzleloader, which delivers a particularly lethal .50 caliber round," the report said. "This weapon is designed with a built-in device to suppress its sound. If any other firearm were built with such a device, it would be subject to the NFA as a silencer. But since this device is designed to suppress the sound of something that is exempt from federal firearms laws, it is not considered a silencer and not subject to the NFA. In fact, it is not subject to any laws at all and can be bought online." The group called on Congress to take action and pass new laws restricting muzzleloaders and the other products outlined in the report. "Before bump stocks were used to kill 58 people and maim hundreds of others enjoying an outdoor concert, most Americans had never heard of the device," David Chipman, a Giffords senior policy adviser, said in a statement. Congress has the responsibility to look forward not just backward. It’s time for them to show courage and leadership by drawing a line in the sand and saying they will defend the safety of Americans over an industry trying to line its pockets."